Orthotics (plural: orthoses) are an orthopedic device that supports or corrects the function of a foot, Podiatrists use Orthotics to correct for abnormalities in a patients GAIT often these abnormalities will manifest in some sort of pain this can be foot pain, knee pain, hip pain or pain in the lower back. Orthotics are designed to control function of the foot by treating any imbalances or modifying areas of over weight bearing within the foot. We will usually take a detailed medical history and a history of pain you may be experiencing. We may also refer a patient for a x-ray or ultrasound. 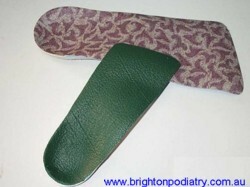 Custom functional Orthotics are made from casts that are taken in a “neutral” position. Orthotics can improve the stability of a foot and allows the normal function of the foot to continue. The controlling factor of the Orthotics helps to diminish the soft tissue and osseous strain and alleviates the symptom complex. Patients of all ages may benefit from the use of orthotics, if the skeletal structure is out of alignment orthotics may defiantly help. Young children generally adapt to wearing orthotics extremely well, older patients initially may take a little longer to get used to them, however once they do get used to wearing Orthotics they generally appreciate the benefits they provide. If you want to know whether orthotics may be able to help you call us at Brighton Podiatry and make an appointment to see the Podiatrist. If you wear orthotics or you have pains in the leg, foot or lower back give us a call we can assess your suitability for Orthotics.